Naval Academy midshipmen captured top honors at the 11th International Submarine Race, held in late June, with their entry, S.S.H. 11 Mighty Mid. Mighty Mid, a two-man fiberglass sub built by the academy team, sported waving fins that can be powered by pedaling, which they adapted from use on some kayaks. 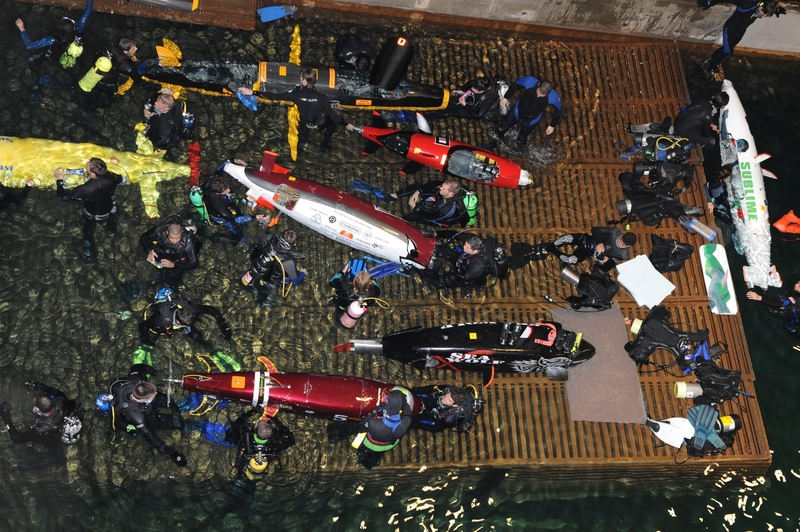 Mighty Mid hit 6.1 knots underwater on the 100-meter course at the David Taylor Model Basin in West Bethesda, Md., besting a Canadian team who had previously held the title and record for non-propeller subs. Some of the propeller-driven subs were faster, but not my much. The fastest, built by Florida Atlantic University, clocked in at 6.814 knots. Twenty-nine teams competed at the sub race, coming from places as far as France and Oman. Mighty Mid won the Spirit of the Race award and top honors for overall performance, bringing home a trophy and $1,000. You can check out the 5-minute DoD Live video – complete with Jacques Cousteau-esque underwater shots – here.